County Durham and Darlington Fire and Rescue Service is in the North East of England and serves an area of approximately 2,460 square kilometres. 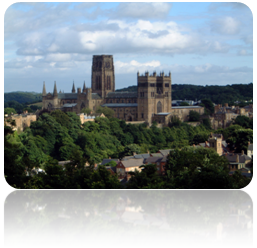 Durham City and the larger industrial and commercial towns are in the east of the area; in contrast the west is predominantly rural consisting of open moor land and wooded river valleys and is sparsely populated. Darlington, our largest town, lies in the South and is undergoing significant regeneration. With good transport networks, the area is accessible by rail via the East-Coast mainline, by road via the A1 (M) and A19 and by air via Newcastle and Durham Tees Valley International Airports. During the last twenty-five years the traditional industries, such as coal mining and steel manufacturing, have disappeared and have been replaced by high-tech factories and modern business parks in towns such as Peterlee and Sedgefield. Further regeneration is taking place in other local areas such as Spennymoor and Bishop Auckland. Darlington, Derwentside, Durham, Easington, Wear and Tees. Barnard Castle, Darlington, Consett, High Handenhold, Durham, Crook, Seaham, Peterlee, Wheatley Hill, Spennymoor, Sedgefield, Newton Aycliffe, Stanhope, Bishop Auckland, Middleton-in-Teesdale. Use this link to view Station activity select the station and click on the 'performance' tab. The Command and Control Centre is responsible for handling all emergency calls, determining correct resources, mobilising and providing all back-up assistance. In addition it is responsible for maintaining operational cover to ensure fire appliances are always strategically deployed to meet the standards of fire cover.